Vitality Drink with prebiotic ingredients for dogs and cats. It is offered in liquid formulation, absolutely innovative, without any colourings or preservatives, featuring excellent and proven palatability both for cats and dogs*. ENERBIOTIC is the Vitality Drink with prebiotic ingredients for dogs and cats. It is offered in liquid formulation, absolutely innovative, without any colourings or preservatives, featuring excellent and proven palatability both for cats and dogs*. ENERBIOTIC – oral prebiotic solution for cats and dogs – contains INUFOS- 3 (inulin + ß-glucan from beer yeast). – maintenance of the natural cellular physiology at skin level – healthy coat and glossy fur. 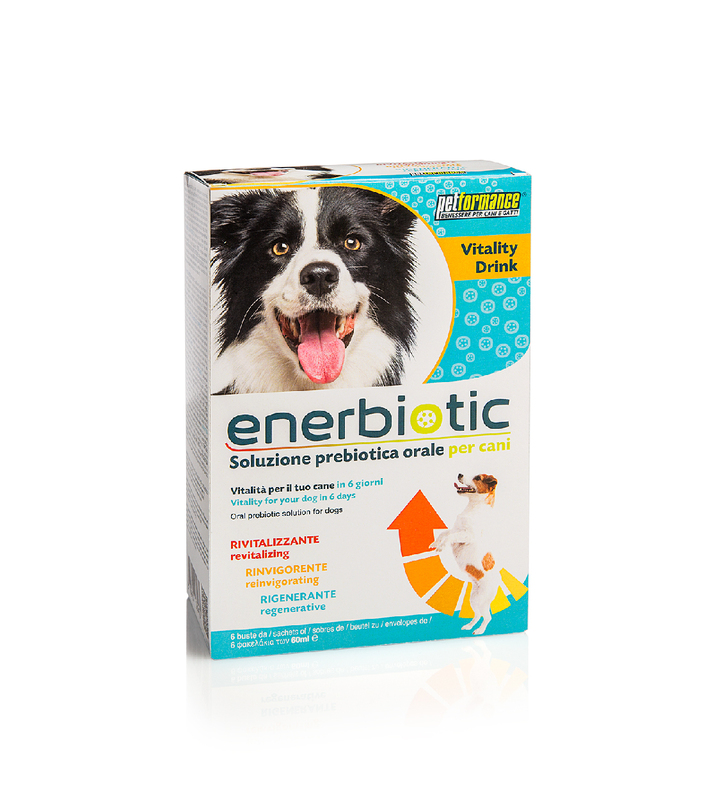 ENERBIOTIC may be used every day in addition to the pet’s normal food. Administration is recommended in the morning. Shake well before use. The product must be administered as is or added to water and/or food as required. Complete the daily ration with your usual pet food. Always have fresh water available. Store in a cool, dry place. After opening, if not fully used, refrigerate and use within one day. SPECIAL WARNINGS AND PRECAUTIONS FOR USE: do not exceed the recommended daily ration. In the event of proven intolerance to sugars carefully weigh taking the product. The association or simultaneous administration of vitamin D3 with vitamin D2 is prohibited. SPECIAL PRECAUTIONS FOR STORAGE: store at a controlled ambient temperature (15-30°C), avoid exposure to direct sources of light and heat. The expiration date refers to a correctly stored product in an unopened package. water, animal by-products, animal fat, dairy by-products, maltodextrin, dextrose, inulin from chicory (0.45%), sunflower oil (0.4%), calcium carbonate, beta glucan from yeast (0.20%), sodium chloride. ADDITIVES: Nutritional additives : Vitamins : E671- Vitamin D3 (cholecalciferol) 390 IU/kg, 3a700 Vitamin-E (all-rac-alpha-tocopheryl acetate) 52 mg/kg, 3a821 Vitamin B1 (Thiamine mononitrate) 10.5 mg/kg, 3a831 Vitamin B6 (pyridoxine hydrochloride) 28 mg/kg, 3a316 folic acid 2mg/kg, 3a880 Biotin 1.5 mg / kg, 3a890 Choline chloride 0.38 mg/kg, 3a370 Taurine 1220 mg/kg. Compounds of trace elements: E4 Copper (Copper sulphate pentahydrate) 5.7 mg/kg, E5 Manganese (Manganese sulphate monohydrate) 6.5 mg/kg, E6 Zinc (Zinc sulphate monohydrate) 25.6 mg/kg, 3b201 Potassium Iodide 1.5 mg/kg. Technological additives, Sensory additives. Crude protein 5.28 – Crude oils and fats 5.63 – Crude fibre 0.6 – Crude ash 1.0 – Humidity 86.53 – Total sugars (sucrose) 0.1 – Sodium 0.1 – Calcium 0.21. SIDE EFFECTS: ascertained individual hypersensitivity to the various components. UNDESIRABLE EFFECTS: Side effects that may occur following treatment with ENERBIOTIC are rather mild and transient in the gastrointestinal system. Non-specific gastrointestinal disorders (diarrhoea, flatulence, dyspepsia) have been observed rarely only in 1% of cases, and regressed spontaneously after a few days of treatment. OVERDOSE: no instances of overdose have been reported. INTERACTIONS WITH DRUGS AND OTHER FORMS OF INTERACTION: none known.